What’s happening in the world of outdoor gear and apparel this year? We travelled to the Outdoor Retailer Winter Market — an annual trade show in Salt Lake City, Utah, showcasing the newest and most innovative products — to find out. Osprey has been one of Canada’s favourite pack-makers for a while now — and with good reason. From their technical mountaineering packs right to their daypacks, everything they do is tested and designed to ensure extreme technical performance. For 2014, Osprey's big stories are their Mutant mountaineering pack — a streamlined, lightweight (800 to 1,000 grams) pack for serious alpinists. I also really liked the look of the Kode series packs, built for backcountry skiers. The 42-litre and expandable 22+10-litre are both ABS compatible — ABS systems boast a 97 per cent skier survival rate when used in an avalanche — and come with a host of ski-friendly features. Also, Osprey’s travel-trek series, the Wayfarer (women) and Waypoint (men) are perfect for the adventure travel enthusiast — featuring hideaway backpack straps and a removable and highly functional daypack. Well-known for making quality Fido-specific packs — yes, the dog should carry his own gear (and some of yours) — Ruffwear rolled out new saddlebag covers for their popular line of dog packs. Constructed out of 210-denier DWR-treat rip-stop nylon, seam-taped with drainage holes, these bags will keep your mutt’s kibble bone-dry. GoMotion is not a well-known company for Canadians — but it should be. This company aims to make the headlamp obsolete with a line of lights that mount on your chest or waist — either by attaching to your existing packs or fuel belts or via GoMotion’s proprietary packs and belts with integrated lights — and provide a full 100 lumens of power for eight hours without fade. Rear mounted battery packs feature flashing red lights for high-visibility. Vancouver-based Arc’teryx is a company well-known to Canadians. Famous for making high-end technical mountaineering and climbing apparel, Arc’teryx showcased a very interesting “White Line” of ski apparel. I loved their Lithic Comp jacket and pants, which feature a blend of Gore-Tex hard shell and stretchy soft-shell for active ski-mountaineering, while still remaining waterproof and breathable throughout. Arc'teryx is the first company to build such composite outerwear while still maintaining Gore’s high standards for waterproofness. Jetboil has long been a popular product for camp cooking — and they’re really heating things up with the introduction of 2014’s Joule. This is a cooking system for groups of hungry hikers — a 2.5-litre canister attaches above a 10,000 BTU burner (your kitchen range is 16,000 BTU). It will boil one litre of water at -12 degrees Celsius in two minutes, 40 seconds; it also simmers, which virtually no other canister stove can do. I loved my meeting with Duckworth. This Montana-based apparel manufacturer is the only company in North America doing sheep-to-source wool clothing. They partnered with a Montana rancher who raises quality mountain-grown sheep (at 2,900 metres! ), which are sheared and their wool sent to South Carolina for spinning on 100-year-old equipment. The apparel is constructed back in Montana — base layers, mid layers (waffle print) and outerwear. The best part — these mountain-grown sheep produce wool that has a natural “crimp,” which creates a very stretchy fabric without blending in synthetics. Hoka One One makes weird-looking sneakers. But PR rep Chris Denny, owner of Denny Ink, was passionate that these running shoes will “change my life.” From the Mafate 3, to the Mafate Speed, to the Bondi — the oversized, incredibly stiff, soles are like no other runners I’ve seen. They claim to reduce injury and improve form. We’ll test ‘em and let you know. We reviewed the outstanding, through expensive, Suunto Ambit2 in our Fall 2013 issue. For 2014, Suunto will unveil the Ambit R — a similar unit, though specific for runners and at half the price ($299 for the heart-rate monitor version). Its astonishingly detailed data — heart rate, respiration, ascent/descent, speed (plus max/average), calories burned, distance, GPS route, ghost runner and so much more — are more than fun to check out, they’re vital for pro-level training. Salomon showed me a lot of gear. Right out of the gate, their Carbon Skate Lab Nordic skiing boot ($900!) was impressive. So light! And so durable, thanks to the carbon fibre. If the price is freaking you out, well, just remember the boot should last forever and the lining and toe/heel can be replaced. Salomon is claiming this boot is a “game changer.” In their apparel section, the S-Lab Hybrid jacket was exciting. This lightweight running jacket features strategically placed waterproof panels, plus a Quick Stash waistband that allows you to strip off and roll it into its own waist belt without ever stopping your run. Reps for Easton were stoked about their new Artica line of snowshoes — featuring high-quality build and three different models (backcountry, hike and trail), they start at only $109, which is a price reduction of about $50 or more from last year. 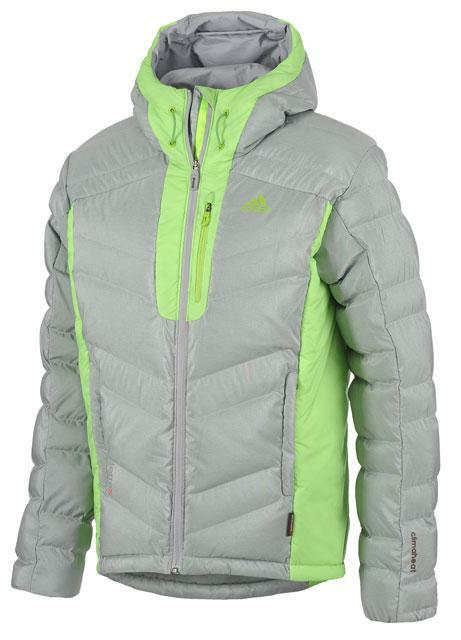 Adidas Outdoors has a lot to offer — but the big story is their Terrex Climaheat Ice jacket (pictured above). Stuffed with Primaloft Down Gold (70 per cent goose down/30 per cent PrimaLoft — equivalent to 750-fill down and retaining 95 per cent of its warmth when wet); using Cocona linings (made from recycled coconuts); designed to create loft space between you and the liner for ultimate warmth; and featuring strategic stretch panels — this $350 puffy is making some bold claims, and we’re going to test it hard to make sure it performs. So far, though, it looks bomber. Canada Goose is coming on strong with their new technical hard shells. Featuring their proprietary three-layer Tri-Durance fabric, the company has built hard shells that stretch like soft shells. Waterproof, seam-sealed, breathable and tough? Of course, it’s Canada Goose. For 2014, the company has expanded the line of these shells for both men and women. They pair well with the Hybridge Lite mid-layer for a cold/wet weather setup for the discerning outdoorsperson. Stay Tuned for Updates From Day Three!